DIE Veneris, 26 die Octobris. Message from H. C. with Votes for Banishment of Priests and Jesuits. E. Claveland's Bill. Sparrowe's Petition against it. D. Bucks and L. Butler Quarrel and Challenge. D. of Bucks and L. Arlington, Injunction to prevent a Quarrel. ORDERED, That the Committee of the whole House for further debating the Bill against importing of Irish Cattle, &c. shall not sit beyond the Hour of One of the Clock this Day. 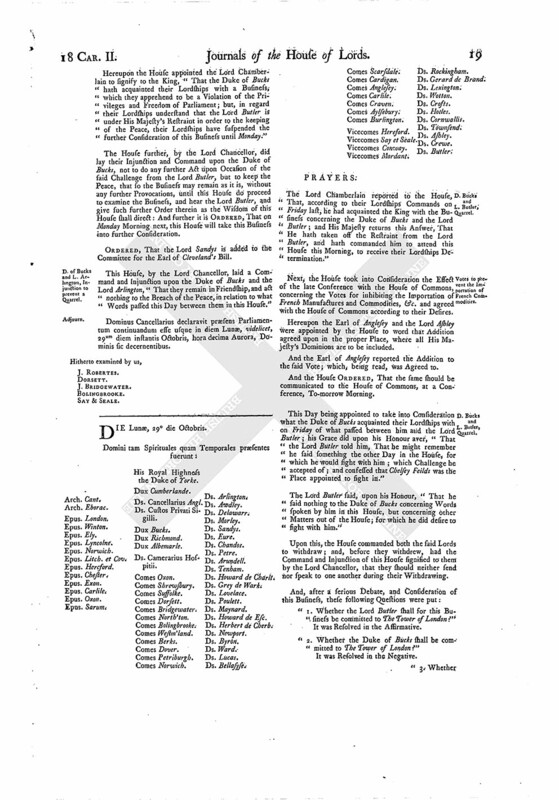 The House was adjourned into a Committee of the whole House, to consider further of the Bill against importing Irish Cattle, &c.
A Message was brought from the House of Commons, by Mr. Hungerford and others; who brought up several Votes for the Banishment of all Priests and Jesuits out of this Kingdom, &c. to which their Lordships Concurrence is desired. The said Votes being read, it is ORDERED, That this House will take these Votes into Consideration on Tuesday Morning next. That this House will send an Answer by Messengers of their own. Upon reading the humble Petition of John Sparrow this Day in this House; shewing, "That he having a Debt of Four Thousand Pounds secured to him, out of the Manors of Hackney and Stepney, which he is likely to be made incapable of recovering, if the Bill for enlarging the Time given by a former Act for Redemption of Mortgages made by the Earl of Cleveland, now before this House, should pass as it is:"
It is therefore ORDERED, by the Lords Spiritual and Temporal in Parliament assembled, That the said John Sparrowe shall be heard, by his Counsel, on Wednesday next, at the Bar of this House, concerning the Matters contained in his said Petition relating to the said Bill. After this, the Duke of Bucks acquainted this House, "That Yesterday the Lord Butler did challenge him to fight, upon Occasion of some Words that he spake in this House, upon Debate of the Business Yesterday; which he conceived his Duty to give this House an Account, as being a Peer and Member of Parliament." Which Business their Lordship were very sensible of, as a Matter that highly concerned the Honour of this House, and the Freedom and Privilege of Parliament, and every Member thereof. Their Lordships were further informed, "That the Lord Butler was secured, by Command of the King, to prevent the Breach of the Peace." Hereupon the House appointed the Lord Chamberlain to signify to the King, "That the Duke of Bucks hath acquainted their Lordships with a Business, which they apprehend to be a Violation of the Privileges and Freedom of Parliament; but, in regard their Lordships understand that the Lord Butler is under His Majesty's Restraint in order to the keeping of the Peace, their Lordships have suspended the further Consideration of this Business until Monday." The House further, by the Lord Chancellor, did lay their Injunction and Command upon the Duke of Bucks, not to do any further Act upon Occasion of the said Challenge from the Lord Butler, but to keep the Peace, that so the Business may remain as it is, without any further Provocations, until this House do proceed to examine the Business, and hear the Lord Butler, and give such further Order therein as the Wisdom of this House shall direct: And further it is ORDERED, That on Monday Morning next, this House will take this Business into further Consideration. 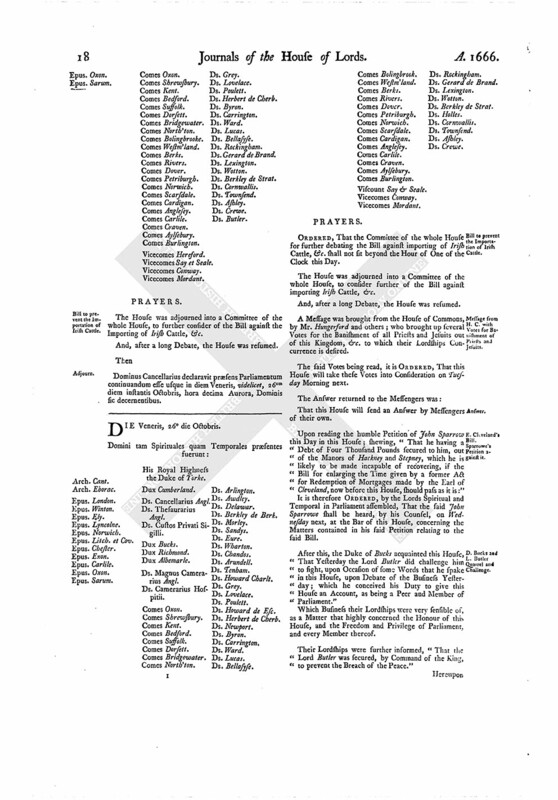 ORDERED, That the Lord Sandys is added to the Committee for the Earl of Cleveland's Bill. This House, by the Lord Chancellor, laid a Command and Injunction upon the Duke of Bucks and the Lord Arlington, "That they remain in Friendship, and act nothing to the Breach of the Peace, in relation to what Words passed this Day between them in this House." Dominus Cancellarius declaravit præsens Parliamentum continuandum esse usque in diem Lunæ, videlicet, 29um diem instantis Octobris, hora decima Aurora, Dominis sic decernentibus.